Bret: Introduction and mention of our FHC dancers and Men in Black. In the past, we let Eli speak for himself but since that is no longer possible, we are here to do it for him. We are honored to share his story with you. Sue: Let me tell you about a boy named Eli. From the day he was born, Eli loved life. He woke up with a smile on his face almost every day. He loved nature and video games, Family Guy and South Park, the Renaissance Faire and The Lord of the Rings. He had a keen wit and a great sense of humor. He was kind and loving. A life-long vegetarian and junk food aficionado, he enjoyed Indian and Mexican food, any type of cheese, onion rings, ice cream and candy. He loved his home in the woods, but the ocean was his true element. He was at his happiest rolling around in the surf on his beloved Keiki Beach in Hawaii. An only child, he made his Mama and Papa very happy and proud. For the most part, Eli had an uneventful and content childhood. He was healthy and growing. Then something changed. In 2004, Eli began to have episodes of agonizing pain. He would wake up in the middle of the night and run around screaming. His parents took him to his doctor, who said that Eli probably did not want to go to school and it was all in his head. His parents knew better. Every time his pain would return, they took him to the emergency room and were told that Eli was constipated. His parents wanted to believe this was the case but deep down, they suspected something more serious was wrong. Finally, in September 2004, during another episode and ER visit, Eli had an MRI. And his parents got the news that even they were not prepared to hear – Eli had a mass growing in his spine. A few days later, the tumor was removed and we came face to face with the monster known as Ewing’s Sarcoma, a rare and aggressive cancer that grows in bones and soft tissue. About 250 children in the US are diagnosed with Ewing’s each year – a ratio of about three children per million. We always knew that Eli was a special child but we did not want him to be special in quite this way! 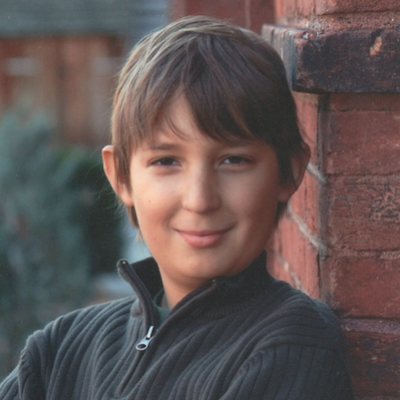 Eli’s cancer was localized and in his spine, which meant that he had a 70% chance of survival. Following surgery to remove the tumor, Eli was given the standard first line treatment for Ewing’s. This consisted of 14 rounds of very strong chemotherapy. Every three weeks for a year, Eli was hospitalized for 5 days to get 5 different chemo drugs pumped into his body. And between rounds, he would frequently wind up back in the hospital due to infections and fever. Bret: As you all know, when a child is being treated for cancer at the Penn State Hershey Children’s Hospital, the family is signed up to receive benefits from the Four Diamonds Fund. Of course, you have just been told that your child has cancer, so you are in a state of shock and a lot of things don’t really sink in. You accept the Four Diamonds information and then you get sucked into the treatment. After Eli’s first round of chemo, we were getting discharged from the Med Center and the doctor came in and gave us a prescription for a drug that would help Eli’s body recover in time for the next round of chemo two weeks later. He had called the prescription into the Hershey Pharmacy so that we could pick it up on the way home. Sue and Eli stayed in the car and I went in to get the prescription. I walked up to the pharmacy counter and said “I’m here to pick up a prescription that was called in for Eli Sidler.” The young woman behind the counter went and brought back a small paper bag. She looked down at the receipt and stared at it in disbelief. She said “That will be $2,700.” I said “What?” She showed me the receipt and said “I’m sorry, but it says $2,700.” I stood there for a moment, then told her we were signed up for the Four Diamonds Fund and asked if that meant anything. She went back to talk to the pharmacist. He came out and said “Mr. Sidler, we have you listed as a Four Diamonds family. From now on, whenever you pick up a prescription for your son, all you have to do is sign the receipt and that is it.” Remember, this was just after the first of 14 rounds of chemo. Eli’s pharmacy bills for the first year of treatment alone were over $100,000. Because of the Four Diamonds Fund we didn’t have to worry about getting Eli the medications he needed. This is why you are a part of our story. This is why Christopher Millard’s story has not ended – and will go on. Sue: Eli was hospitalized 26 times during that first year. The Medical Center became our home away from home. He was often nauseous and did not have an appetite. He lost his hair and grew thin. But despite his struggles, Eli rarely complained or asked “why me?” While he did not consider himself to be particularly courageous, his father gave him the nickname “Chemowarrior” as a badge of honor to acknowledge all he was dealing with. Halfway through that first year of chemotherapy, Eli received 30 radiation treatments to try to kill any remaining tumor cells in his spine. The radiation burned his esophagus and within a few weeks it had closed up and he was unable to swallow. For the next year, he had to be fed through a tube inserted in his stomach and carry a cup around to spit into because he could not even swallow his saliva. After his 14 rounds of chemo were over, Eli had three surgeries to open up his esophagus and he had to learn to swallow again. Following his initial year of treatment, Eli slowly but surely returned to life as a normal 10-year-old boy. Every three months he would have CT and MRI scans to make sure the cancer had not returned. He seemed to take these in stride but for us, those were harrowing times, waiting for the scan results. Bret: Although we tried to return to as normal an existence as possible, life as a parent of a child with cancer is never “normal.” Piece of mind is a thing of the past and worry is your constant companion. Every little pain your child has becomes a cause for concern. Doctor visits are a way of life. But through it all, we never had to worry about the cost of Eli’s scans, blood work or prescriptions. There was never a concern about whether our insurance company would approve an MRI, PET scan or any other test because we knew that the Four Diamonds Fund would pay for any uncovered expense. This is why all of you are part of our story. Sue: Eli remained in remission with no evidence of disease for the next two years. We were finally starting to relax a bit when one of his routine scans in the fall of 2007 showed a tumor growing in the same location as before. This time, he had no symptoms. This time, his prognosis was 20% chance of survival. The next line of treatment for a Ewing’s Sarcoma relapse was a combination of two different chemo drugs. Eli was able to receive these drugs every three weeks in clinic, so he had fewer hospitalizations. On Valentine’s Day in 2008, Eli had his second back surgery to remove the tumor that was remaining in his spine. In true Eli fashion, the surgeon told us that before Eli was put under anesthesia, he asked the doctor to say “Happy Valentine’s Day, you SOB.” to the tumor. That was our Chemowarrior. After another year of treatment, Eli was again in remission but it was not to last. He relapsed again in 2009 and again in 2011. During this time, the cancer also metastasized to his lungs. He had two more back surgeries and various combinations of chemo drugs and radiation but to no avail. On March 24th, 2012 he woke up paralyzed from the waist down. We found this out when I asked him if he was planning to get out of bed that morning and he replied “I would, if I could move my legs.” It had only been three weeks since his last PET scan so without warning or symptoms, the cancer had exploded all up and down his spine. Eli tried to make the best of his situation. He was still able to play Xbox live with his friends and go out to eat at his favorite places. But the paralysis was spreading to his chest and palliative radiation caused him to develop a cough, laryngitis and finally, pneumonia. He went back to the hospital on June 11th and never came home. Two days before he died, he motioned me to his bedside, gave me two huge hugs, closed his eyes and did not wake up again. He passed away peacefully on June 24th, 2012. He was 16 years old. And we, as his parents endured the agony of watching him go through all of this. We had to make many decisions that no parent should ever have to make. But if you asked us if we would do it all again, our answer would be a resounding “yes” and this is why. Because, while we had to deal with the many horrors of having a child with cancer, we also received some amazing gifts. Having Eli as our son for just 16 short years, was a fantastic gift. He faced cancer as if he didn’t have cancer. “Just live life” was his motto and that is what he did. Eli fought his disease for over half his life. Eli had cancer, but cancer never had Eli. Our involvement with THON and the Four Diamonds Fund has been a gift. Each and every one of you here today or involved in THON’s past has given us and every Four Diamonds family the gift of knowing that we can focus on our child and not on how we will pay for the astronomical cost of cancer treatment. Just a couple of months ago, we received a notice from our old insurance company that there was a balance of $30,000 that they refused to pay. When we called to inquire, we were told that Eli’s treatment had exceeded his two million dollar policy limit and the charges had been incurred after that point. But the thing is, we had not realized any of this because Four Diamonds had already covered the costs and we never saw a bill. The last gift I want to mention is a precious one. For any parent who has lost a child, the memory of that child is all they have left and it is so important that their child be remembered. There will be no more photographs or videos of Eli, no new silly stories to share. But we have the wonderful gift of ten years of THON and of being the Penn State Field Hockey Club’s adopted family. We will never forget what they gave to Eli. Imagine being a young teenage boy and getting visits, gifts and attention from many beautiful young women. Eli relished every minute of it and for that we will always be grateful. Because of THON, these young ladies got to know Eli and our family. They know his story. They carry him in their hearts. The club alumni who are scattered across the country and the world share his story with others. Every student in this building or watching online who remembers a child they have met through THON is giving every Four Diamonds family a gift that is so much more than just money. You carry the memory of our child. Eli’s story will go on. And Jed’s story, and Brandon’s, Miranda’s, Lexi’s, Jackson’s, Blair’s, Brittany’s and of course Christopher’s story and so many others. Knowing that you carry our children in your hearts and will not forget them gives us a reason to go on, to get out of bed each morning and face another day without Eli. From the bottom of our hearts, we thank you.